Soccer fans, start cheering!. The new SOCCER STARS collection is here!. So put on your face paint and start coloring - . we bet it will take you less than 90 minutes to complete.... . Craving MORE images?. The sky&apos;s the limit! Take your very own pictures and turn them into amazing pixel art! . Add any pic from your camera or photo gallery, & color away!. . Revised privacy policies due to regulatory changes. Rainbow Color by Number is the ONLY game out there where you can color in both 2D AND 3D images in one game! Pixel art is fun, but 2D and 3D pixel art?! Amazing! And the coolest part is - you get to choose between 2D and 3D! 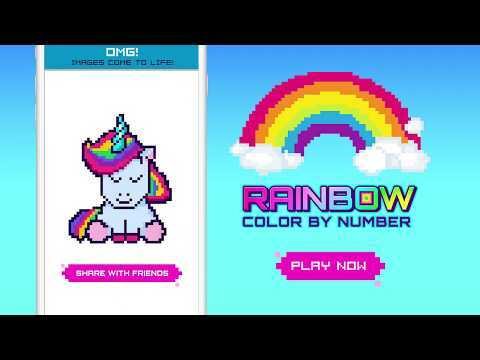 You’re the master of your pixel masterpieces!This relaxing color by... see more Rainbow Color by Number is the ONLY game out there where you can color in both 2D AND 3D images in one game! Pixel art is fun, but 2D and 3D pixel art?! Amazing! And the coolest part is - you get to choose between 2D and 3D! You’re the master of your pixel masterpieces! This relaxing color by number adult coloring book app is full of an infinite number of pixels that are just waiting for you to color them in and turn them into awesome moving 3D images or beautiful 2D creations. All you have to do is color by number to create a 3D or 2D pixel masterpieces. Rotate your creation 360 degrees and watch it come to life, with supercool animation.